Can be folded to consume less space. Most mothers realize at some point that pacing the floor and rocking their baby in their arms does not help with cooking, cleaning or any other activity. An extra set of hands would be appreciated but those may not always be available. If you are in such situation and seek for a proven solution, you may be interested in a baby swing. A device invented to imitate mothers soothing movement that can help you not only get stuff done but also get more sleep at night. Best infant swings produce a rhythmic motion that is familiar for newborns as it is the exact same motion they spend the last nine months in, thus calming them and helping to relax. Several scientific studies as well as countless mothers’ reports show that swings are extremely efficient in soothing even the fussiest babies, including infants suffering from colic and/or reflux. 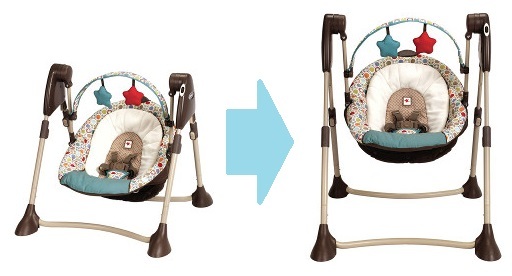 Before buying a new baby swing make sure you know the difference between them and the functions they offer. There are basic models and there are fancy machines with all the blows and whistles. See best devices available on the market. Below you will also find few tips that may help you to choose a perfect baby swing for your and your baby’s needs. This stylish swing features expandable frame which makes it very comfortable in use as it enables you to adjust the height of the seat. On the other hand it can be easily folded that makes it easy to move around the house. As it weights below 14 pounds there should be no problem to transfer it from one room to another or to pack it into the trunk of a car. The metal frame provides stability and durability. You can easily change from full-size mode into a portable mode by pressing buttons on the frame, no screws and screwdrivers are required. The seat can also be easily adjusted to one of three available positions by pressing a button on the back of the seat, which can be done with one hand. To provide additional comfort for the baby the seat comes with a removable head support that is recommended for younger occupiers. It helps to keep baby’s head in optimal position. For security the seat features a 5-point harness that is covered with soft in touch fabric. If need be the cloth covering the seat can be easily removed and washed. Swinging motion supported by this device is head to toe and its range thanks to a stable frame is quite wide. The motor located in the upper left part of the frame operates on 4 C batteries. Its speed can be adjusted to match baby’s mood and preference. Unfortunately it does not have an electric plug. According to customers that are using this device few hours a day the batteries last for over a week so it’s not bad. Great for moms on the go, serving as a travel swing, or for those with restricted floor space. This full size swing is particularly good for mothers that are nursing in a glider chair as it offers your baby the same gliding motion as the gliding chair making the baby feel safe. Due to a unique construction of a frame this swing occupies much less space on the floor than its counterparts. For perfect soothing Glider LX comes with 6 gliding speeds and a vibration mechanism (2 speeds) built into the seat. Having ten different melodies and several nature sounds with adjustable volume can also help to relax. The swing comes with an electric cord but can also run on batteries. It’s worth mentioning that many users highly praise it for a very quiet motor. The roomy seat is covered with soft, plush material. In case of a diaper spillage there is an additional seat pad that can be easily removed and machine washed. The seat has two recline positions which will become useful as the baby grows. While newborns spends most of the time lying flat on the back, older babies would appreciate being able to sit in a more upright position and look around the room. It’s not only comfortable for the baby but thanks to the relatively high position of a seat it is easy for moms to put the baby in and take her out. Such high position of the seat may also be desirable if you have a dog or a toddler as it would limit the access to the baby. Glider LX comes in two gender neutral options: Peyton and Raffy, and is designed for babies up to 30 pounds. High position of a seat. Some people find the assembly instructions hard to understand – it may take some time. Designed for those with restricted floor space but looking for a stable swing. 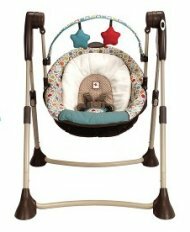 This swing is advertised by Graco as a 2 in 1 Swing and Rocker as the seat can be easily detached and serve as a rocker. Being able to easily hook and unhook the seat makes it very handy if you want to move from room to room but still want to keep an eye on your baby. All you need to do is to just grab the seat and take it with you. Similarly, if you want to move the whole swing, it is easier to transfer the seat and the frame separately. The design allows to the seat to be hung in two different positions and thus you can either sway your baby from side to side or swing from head to toe, depending on baby’s mood. There are six swinging speeds to choose from and a timer to automatically stop the swing after a given time. Graco’s DuetSoothe comes with a stylish, comfortable seat that can be adjusted to one of three available positions. A vibration mechanism, built into the seat, operates on batteries and is independent from the main motor. This means that the seat will vibrate also if you are using it just as a rocker. Thanks to the holder it’s also easy for parents to hold the seat with a baby in it. For additional comfort of the baby there is an inbuilt music player with ten melodies and 5 nature sounds as well as a detachable mobile with toys. Parents on the other hand would appreciate the electric plug that solves the problem of constant battery changes saving time and money. This swing was designed for babies up to 30 pounds and is available in two color options: Sapphire which is darker and lighter, Winslet. Mobile does not move and the toys could be more colorful. They can be easily replaced with your baby’s favorites. If you want to have an option to use the seat as a rocker this may be the best swing for you. The seat is covered with fabric that is machine washable and can be easily removed by unzipping. There are six versions of the cover. Two classic soft covers: grey and black. Along with four plush covers: silver, green, multi and blue. What is worth attention are the seat recline settings. They are not limited to predefined values as in most swings. The recline can instead be adjusted to any angle your baby needs, thanks to unique way it is mounted on a frame. 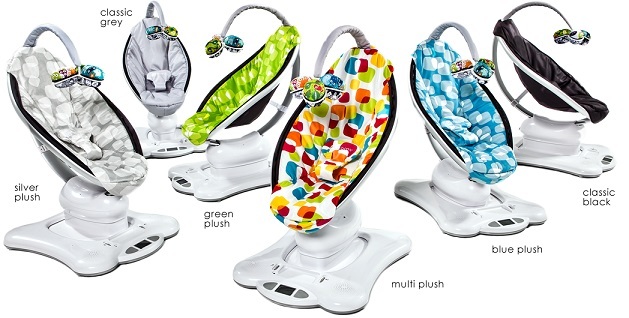 MamaRoo comes with a mobile and three reversible balls which are black and white on one side and colorful on the other. As newborns in their first weeks can’t distinguish colors they will be more interested in patterns on the black and white side. This can be later turned to suit more sophisticated taste of older babies. The mobile can be pivoted to the back of the seat thus giving you better access. For even more relaxing experience there is a built-in music player with several nature sounds and adjustable volume. It also features an audio input (mini jack) so you can connect your mp3 player, iPhone or other source of music and play your baby’s favorite sounds. 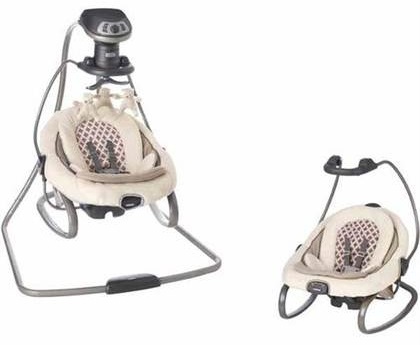 All the settings of a motor and music player are displayed on a LCD screen which along with buttons on its side makes mamaRoo very intuitive in operation. Audio cord is detachable and can be lost. Fortunately it can be easily replaced as it’s a standard 3.5mm Male To Male cable (about $2). If you’re after the best baby swing on the market you can’t go wrong with mamaRoo! Zen swing is advertised as beautiful, practical and shooting, and those three words describe this device most accurately. It’s designed with attention to details and made with premium materials. Intuitive in operation handles and locking mechanisms enable smooth adjustments. These along with easy removable and washable seat cover make it practical in everyday use. 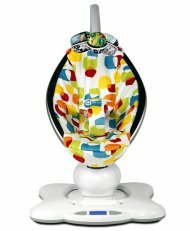 Rotating seat allows for either swinging from head to toe or rock from side to side which along with speed adjustment, music player and the swaying overhead mobile provide soothing environment. The soft, padded seat features a built-in soft blanket to wrap the baby and a head support that is useful for infants. Both of them can be easily removed and are machine washable. For security there is a 5 point harness. There is also a built-in stand at the bottom of the seat so it can be used a standalone chair. This feature is praised by number of moms as they don’t have to remove perfectly contented baby from a chair to move her to another room, instead they can take the baby with the chair. Zen swing comes with fourteen different soundtracks offering a perfect match for both relaxation and entertainment. Older and more inquisitive babies will definitely find the overhead mobile with toys fascinating. A separate motor moves the mobile causing it to swing in front of baby’s eyes providing perfect visual stimulation and helping in healthy development. AC adapter (can also work on 4 D batteries). This cute looking device is highly customizable and due to its reliability has become a synonym of a solid and well-made baby swing. Over the years its construction has been tweaked to provide safety and ease of operation. It features a cozy seat which along with overhead mobile builds relaxing atmosphere. There is also a mirror in the center of the motorized mobile that helps to develop self-awareness as well as efficiently occupy baby’s attention. Thanks to a rotation of the seat your baby can either swing from front to back or sway from side to side. You can also adjust the speed of the motion to your baby’s liking and to maximize the soothing experience there is a music player onboard with 18 tunes to choose from. The seat is covered with soft, plush fabric that is easy to remove for machine washing. Its position can be regulated to so older babies can sit in more upright position. Safety of your baby is guaranteed thanks to 5-point harness that keeps baby in place. Conservative parents looking for a swing with a “classic” look and anyone wanting reliable solution from a reputable manufacturer. Despite the size it easily blends into any room decor thanks to neutral colors. 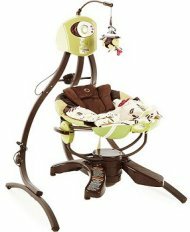 The latest My Little Snugamonkey Special Edition Cradle ‘n Swing by Fisher-Price comes loaded with features and was designed to provide maximum comfort for your baby and optimal sleeptime for both of you. It’s solid, metal frame makes it stable while 5 point harness keeps the baby safe. 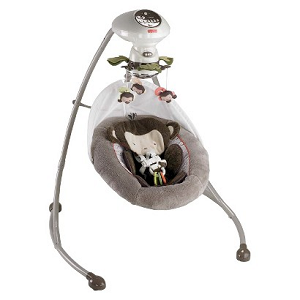 This high quality infant swing comes with AC adapter for your convenience but can also use batteries. The liner of this swing is plush, soft and has a comfy feeling. As it is easily detachable if an accident occurs it would be a breeze to wash it. Once the baby is awake she has plethora of interesting things to watch and listen to. 16 songs and nature sounds can either entertain or soothe your little one. The overhead motorized mobile has several dangling monkeys and to be even more interesting for the little observer it comes with a mirror. Snugamonkey swing comes also with a little monkey blankie toy for baby to play with. It facilitates baby’s proper psychomotor development by stimulating her senses. The seat can rotate and thus the seat would either sway from side to side or rock from head to toe. There are 6 speeds to choose from and thanks to SmartSwing Technology the power generated by the motor to move the seat will automatically adjust to your baby’s weight. This means that it won’t become terribly slow once the baby’s heavier as often happens in low quality swings. They are designed to be used in one place, are larger and heavier. Thanks to the size and mass they offer great stability and can be used with babies up to even 30 lbs. They often come with plenty of additional features. They can be easily transferred from one place to another so this may be a good solution if you want to take the swing with you when you go to another room or take a long bath. It’s also a good option for mothers who often visit friends or family with their little ones. Many are solely battery operated. There are several features that a good swing should, few that may be useful and some that are pointless. The important features will provide safety and comfort for both of you and the baby. Harness is a safety feature that prevents the baby from climbing out of a seat and falling out of the swing. It should be either made with soft fabric or covered with one in order to be comfortable for the baby. The buckle of the harness needs to be both difficult for the baby to accidentally open but at the same time easy for you to operate. It is important to have easy access to the baby so if there are any overhead mobiles or toy bars they should be removable or pivot to the back of the swing. Accidents such as diaper spillages happen, and when they do you want to be able to quickly and seamlessly wash the seat. Different babies have different preferences so there should be a way to control the speed of the motion. As the baby grows she will become more and more interested in the surroundings. You want to be able to regulate the incline of the seat so that once the baby grows she can easily see the room around her. Those can help to keep the baby occupied and entertained but should but are not very important factor when buying a swing as you can always give your baby her favorite toy and use an external music player. Handy feature that helps to save on batteries (money) and time (you don’t have to play with a screwdriver every couple of days). Pediatricians suggest not to swing/sway the baby in a swing for longer than half an hour at one go. In case you lose your sense of time it’s good to have a timer. 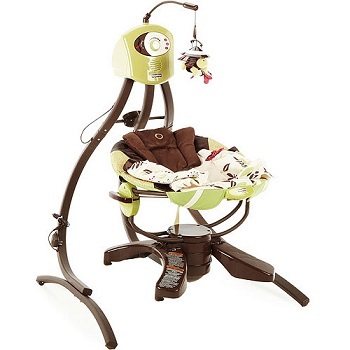 The best baby swing would have a combination of these features that exactly suits your needs. If you’re after efficiency the best baby swing for you would definitely be MamaRoo. 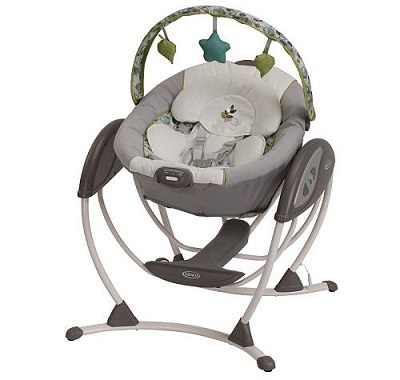 For parents looking for a device that will fit their livingroom decor as well as provide comfort for the baby the Zen Collection by Fisher-Price swing is optimal choice. Those seeking a solid portable swing should definitely consider Graco’s Swing By Me. Previous story What is the best umbrella stroller for travel?